Dethatching as needed can contribute to a lush, healthy lawn. If your grass looks bad, dries out quickly, and feels spongy, this could indicate it has an overly thick layer of thatch. Thatch is a matted layer of dead and living grass blades, roots, and leaves that lies between your lawn and the top of the soil. It builds up when turf produces waste more quickly than soil organisms can break it down. The darker area between the grass and the soil is thatch. A layer of thatch thicker than 1/2 inch can harm lawns in various ways. It weakens the grass by blocking the roots from growing as deeply as they should. When grass roots spread in the thatch layer, the lawn is vulnerable to drying out. A thick layer of thatch also prevents water and nutrients from getting to the roots that are deeper in the soil. It can even promote disease by holding in too much moisture and harboring harmful insects. Dethatching removes these problems, letting the grass roots grow deep into the soil for a healthy lawn. Some people consider dethatching an absolutely necessary annual maintenance task for lawns, but lawn science experts caution that it is often unnecessary and can actually severely damage a lawn. Dethatching is hard on a lawn because it often removes not just the thatch, but also the crowns, blades and even sometimes the roots of the living grass. Using a shovel, dig up a single piece of sod and dirt roughly 6 inches in diameter. Pull it out of the ground, knock off the dirt, and pinch the grassy area between your thumb and forefinger. If the compressed thatch is thicker than 3/4 inch, consider dethatching. Only dethatch if the layer of thatch measures more than 1/2 inch. Because dethatching is hard on lawns, only dethatch when the grass is actively growing and after it has had a chance to recover from the winter season. For cool season grass, dethatch in the early fall. For warm-season grass, you can dethatch in the spring or fall. Never dethatch in the summer, and never dethatch during drought conditions. You can either dethatch by hand with a thatch rake, if your lawn is small, or use a motorized lawn-conditioning equipment. A thatch rake has two sides—one with slightly curved teeth for cultivating soil, and one with straight teeth. The distance between the blades is adjustable. To dethatch, hold the rake with the straight teeth down, and draw it repeatedly toward you through all the grass—two or three passes in each spot. It's the same motion you use when raking the lawn. You'll see the tool pulls out all sort of debris. After you're finished, rake the debris up and dispose of it or add it to the compost heap. 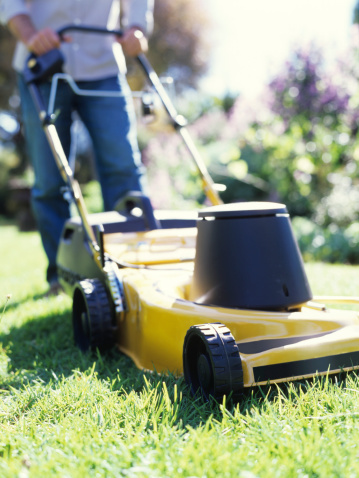 If you have a really large lawn, you might prefer to invest in a self-propelled walk-behind dethatcher, or rent one from a home improvement center or tool rental outlet. Some of these tools are electric, others have gas engines. You can also get a tow-behind dethatcher. Simply walk or tow the dethatcher across the entire lawn, much as you would a mower, overlapping each pass halfway over the previous pass. When you're done, rake up all the debris that you've pulled up and discard it, so it doesn't smother the grass. Be careful, however. If you remove too much thatch you'll severely thin the grass. You can change the spacing between blades and the depth setting of blades to control how much material you remove. If you're not familiar with using the equipment, start by setting the blades high to remove only a small amount of thatch in the first pass. This approach lets you assess the amount of thatch that remains and how much you've thinned the turf so you can decide whether to take a second pass. Use pesticides only as necessary, and stick to a type that doesn't kill earthworms.